Ever since the process of Spine (Edge) Squaring the Centre Stitched / Sewn books was introduced and accepted by the Converters / Stationery Manufacturers, there has been no looking back. 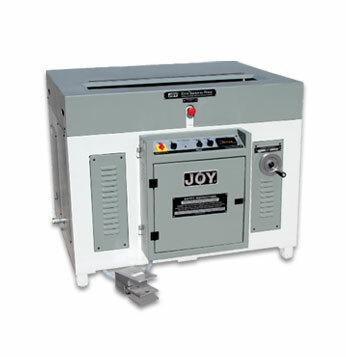 �JOY� launched its first machine in size 310mm (In the year 1999) followed by 410mm thereafter 520(2002), 610mm & 650mm(2003), 1020mm(2005), 800mm(2007), 920mm(2008), 460mm, 710mm & 850mm (2012). A constant dialogue with our customers, to satisfy the need of production requirement has resulted in the Squaring Press to handle 3 or 4-UP Exercise Note Books upto a width of 1020mm. 3or 4 sets of Exercise Note Books (Composition Books/centre thread-sewn or centre wire-stitched) with heavy duplex board as title can be processed in less than 3/4secs. Productivity of over 9000 (1000x3x3) or 12000 (1000x4x3) Exercise Note Books per hour can be achieved with little or no training. Safety precaution - Emergency Switch aborts the Operating Cycle and opens the Moving Platen to reset position in case of an accident. Intricate built-in Safety Device protects the fingers of the operator. Power Saving feature ensures the motor switches off automatically after Pre-set delay time (incase the recycle function is not activated). The high speed Blower / Exhaust Fan ensures the ambient temperature in the Power Pack Area is maintained for consistent production and longer life of Rubber hoses / seals & hydraulic components etc. PLC based control panel for sequencing, optimum reliability and simplified diagnostics. Castors are provided for maximum mobility for space saving.